For most of his career Michael Doret has been well known as a letterforms artist and designer whose work has overlapped the areas of lettering, illustration and graphic design. Although the work always involved lettering, it was a very different discipline from the world of font design. 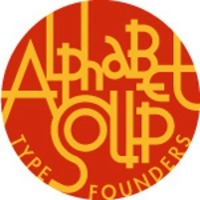 Recently he expanded his letterforms work into that area under the name “Alphabet Soup Type Founders”. Having been a letterforms artist for many years, he believes that he brings a very different perspective to the art of font design from most other foundries. He’s now bringing these years of experience of creating art with letterforms to bear on his font design efforts, so that with each new font released he’s pushing the envelope and coming up with something new, or a novel twist on the familiar.